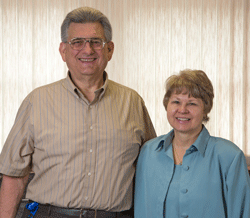 Dr. Thomas Witwer and his wife Theresa – married over 40 years now – are the team at Witwer Chiropractic in Sidney. Together they have two adult children and use what they’ve learned over the years in raising their own family to create a warm and understanding, close-knit office environment. You’ll find Theresa handling everything from marketing to front office operations and insurance billing. And of course Dr. Tom cares for patients and gets to know each individual family and need. Why Are We a Chiropractic Family? In his work as a painting contractor, Dr. Tom met a chiropractor who befriended him and began to share how chiropractic care might help some of the issues he and Theresa were experiencing – specifically back pain and migraine headaches, but not necessarily infertility. Theresa and Dr. Tom both began to participate in regular chiropractic care and within 45 days Theresa was pregnant! When they asked about the miracle and if it was coincidence, their chiropractor told them that being adjusted regularly has been shown to help many people struggling with infertility! Dr. Tom was inspired to help others through chiropractic care, and he continued with his education to qualify for graduate school. By the time they were expecting their second child, the Witwers were moving to Marietta, GA to attend Life Chiropractic College, now Life University. When you start chiropractic care at a young age, results are quicker, healing is better, and it lasts. It’s important to start early because it gets the best results. But no matter where you’re starting, we provide a system of adjustments and education, aimed at getting the individual healthy and growing the family in wellness. “I consider myself to be a family man,” says Dr. Tom. And he promotes that atmosphere and attitude in the office. Call us today at (937) 498-0076 for an appointment with Dr. Tom.